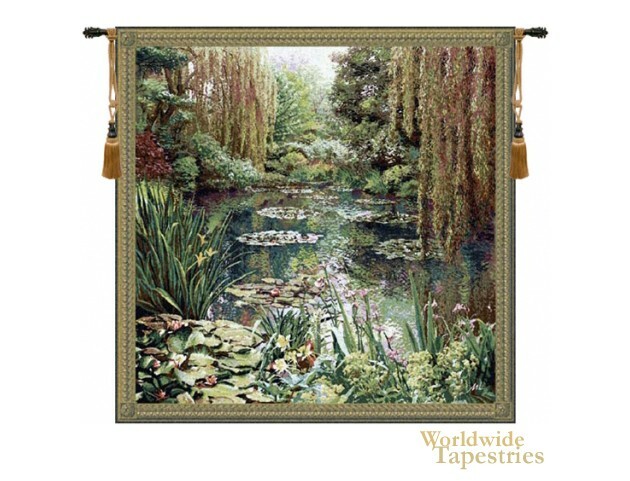 Monet Lake Giverny III tapestry shows the famous lake and gardens of Claude Monet's home. Here we see the gorgeous green lily-pads and the violet flowers going beautifully together, complete with auburn willows and other plants and trees so abundant in the garden to create a work of art on its own, then rendered so beautifully in the original by Monet. A specialist in impressionism painting, Monet (1840 - 1926), was the most famous of the impressionist movement with renditions of nature in a light and color which caresses the imagination and world of feeling as much as being pure visual delight. This landscape tapestry is backed with a lining and a tunnel for easy hanging. Note: tapestry rods and tassels, where pictured, are not included in the price. Dimensions: W 89" x H 81"